I probably shouldn't write this post. But I'm going to. I probably shouldn't let certain things upset me. But I do. I am sitting here in my kitchen in a very quiet house. I only hear an occasional sniff which reminds me that I'm crying. I can't believe I'm crying. This has been a very taxing week for me. Physically and emotionally. New wake up times, new routines, new therapists and new teachers to meet. Driving much more and lugging things here and there. Collapsing into bed at night and working through major arthritis stiffness in the morning to get moving more than an hour earlier than usual. Trying to figure out boundaries when before there were none. Trying to figure out my new place in my son's life during the day when before it was all about us. Waiting anxiously to pick Gavin and Sara up to hear about their day - and bummed at how much I miss. Trying hard to make things normal and just as exciting for Brian, too. Then taking Gavin to the emergency room last night and finding out he broke his finger. Now waiting to hear back from his regular hospital so he can see his orthopaedic doctor as soon as possible. The stress never ends. But the one thing that brought me to my breaking point this morning...that has me in tears...is the school bus. Let me introduce you to the two wonderful people who keep my precious little boy safe on the bus ride to school. This is Bruce and Marie. Do you know that Bruce was once in the Air Force? And Sara tells me that he is such a safe driver. His biggest concern is making sure that his 'precious cargo' are happy and safe on the bus. 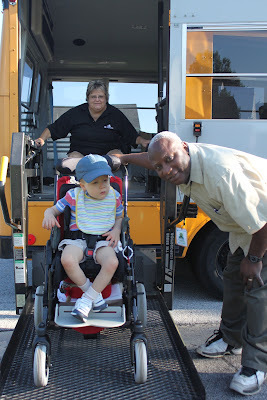 And then there's Marie, the bus aide that helps get the children buckled in and strapped down. She's an avid quilter, just like my Mom used to be. This first week, everyone's trying to get used to everything. Me, the teachers, Sara, Gavin and, of course, Bruce and Marie. When they arrive to pick Gavin up, they lower the wheelchair ramp. Then they lift it up and Marie pulls Gavin's chair back into the bus. 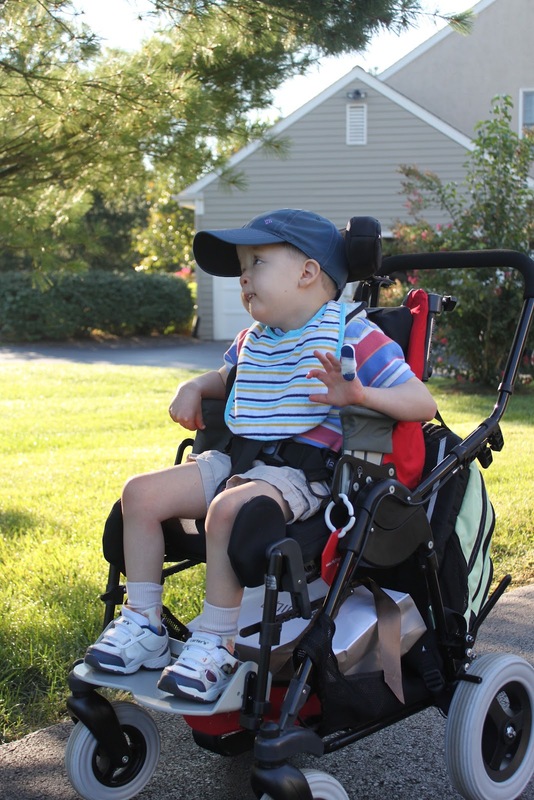 Gavin rides to school in his wheelchair and there's a process to secure it. Straps that are bolted to the floor need to be attached to all different areas of his chair and then tightened. Then they need to put belts and straps around him as well. It absolutely takes some time - and this Mom is glad about that. Bruce and Marie don't let anything distract them from making sure that both the wheelchair and Gavin don't go anywhere. I would like to think that I'm a considerate neighbor. When I noticed that it was a rather long process, I sent out a mass email that reached 93 out of 95 of my neighbors to explain to them that there might be delays on our street at that time in the morning. Our street is one of the exits out of the neighborhood so I thought if they needed to change their routine they could go out the other exit if they didn't want to wait. Just to give them a head's up. 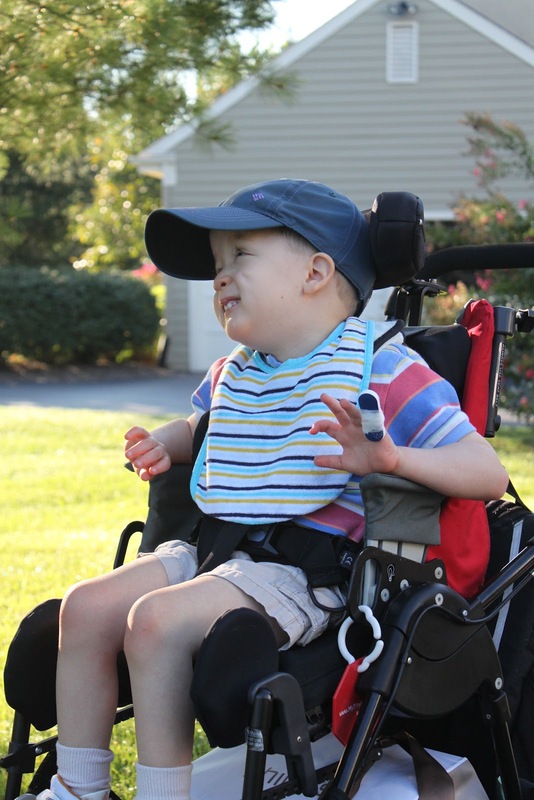 And I said in the email that if they did choose to wait, that perhaps they could say a little prayer for Gavin as he begins a new journey away from his family. This morning we were all outside waiting for the bus to come. 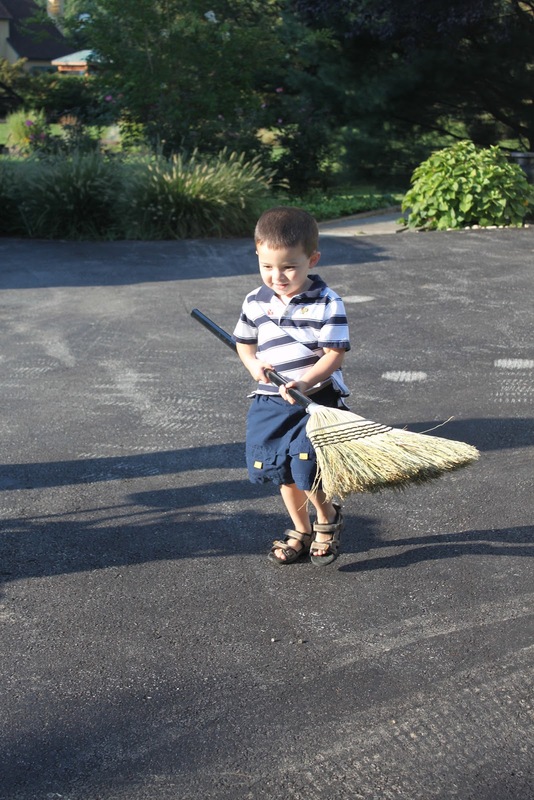 Brian entertained himself by sweeping the driveway. Finally, the bus came and once they lifted Gavin in and folded up the lift, Brian and I went back inside while they strapped Gavin in. I had to get Brian ready to drive him to school. I happened to look out my window and saw a car pull up behind the bus. After about a minute, a person got out of the car and walked up to the bus - peering in and saying "What's going on?!?". Then got back in the car only to get out again another minute later to look in the windows of the bus again. I felt my heart beating out of my chest. I ran outside and all the way up the driveway and explained what was going on...trying to stay calm while my heart was beating out of my chest and my blood pressure was quickly rising. Then I put Brian in the car and tried very hard not to cry as I drove him to school. So, I was thinking about putting a sign on my front lawn. Maybe "Expect delays - a little boy in a wheelchair needs extra time to get on the bus". Nah. Maybe "Patience is a virtue. Count your blessings." Nah. Maybe "Tread lightly on the heart of the Mom who lives here." I don't really know what to say, but I'll tell you what my biggest fear is. That this is just the beginning. That people will feel inconvenienced by the time it takes my son to do things. Or worse...that Gavin or Brian will catch on and it will hurt them in some way. If you are reading this and you live near me, please...please be patient if you see those flashing red school bus lights. This child, who we were told may never even sit up, is going to school! On a bus! And the Mom inside this house - she's trying so hard to let him go. Please...please don't make this harder for any of us. I am so sorry you had to deal with an impatient person this morning!! I am sure we have all at one point or another been "that" person, not knowing the story behind whatever it is that might be irritating us. My sister had a major stroke 8 months ago. Since then my eyes have been opened to the struggles of dealing with a wheelchair, the difficulties in opening doors, using a restroom, and all the other things that take so much longer to do now. I have encountered some very kind and considerate people for which I am thankful but I have also seen the rude and impatient ones...and each time I am thankful that it is my famaily that is dealing with these struggles, as I am afraid of how some of those people may treat a loved one should this be the hand they are dealt. Only once you are in the situation can you fully appreciate the things that are involved. Don't let them get to you, maybe they woke up late, maybe they forgot about an appt they were rushing off to...but you know what? Thats NOT your fault!!! Just as they don't know your story, you don't know theirs and there is nothing you can do to change that...nor should you!! You went above and beyond to attempt to let people know that they may run into a delay, thats all you can do! Some people may never appreciate the blessing they have..and thats a shame but for those of us who do know, we can't let the rest of them get to us! Stay strong Kate, wipe your tears and move on...you are a great mother, wife and person!!!! Just wondering though can the bus pull into the driveway? Ryans bus reverses right in in the morning and afternoon. Love the first couple responses-we don't ever fully know what anyone is going through (even the grumpy, impatient drivers), do we. I am quite sure though, Kate, that unless your neighbor is a comlete and utter OGRE, they were not *at all*! impatient/angry towards you and most especially not at dear, sweet Gavin. They were likely questioning the bus drivers in this situation. In any case, as your first reader pointed out more eloquently than I am, I so hope you can find a way to shrug it off. It would be so wonderful if the driver could pull into your driveway as Marie Clare suggests. Just wanted you to know that I went ahead and whispered that prayer that you were hoping your neighbor would have found it in their heart to say. The Lord bless and comfort you, Kate and may He lift up Gavin and fulfil all the plans He has for him. The car drivers are grown ups. They will adjust if for some reason the bus company can't use your driveway for strap in details. Once the bus schedule is more predictable, it will be easier. I love your blog! You have such an eloquent way of explaining your family's life experiences. That was very considerate of you to send the email to neigbbors. I hope everything works out and there's no more incidences like this one. You're such an inspiration of all you do for your kids. Very tough if there is nowhere else to stop the bus except in the middle of the road. My daughters bus would also take up the whole road, but luckily there is usually parking, so I haven't upset the neighbours yet, but I have been mortified when my sons bus arrives at the same time, so that my kids' buses are taking up the entire free parking! Oh, honey. I feel for you. It's funny how differently we all can feel about how people perceive our children and their issues. I immediately go to the defensive place, and would have run out to explain nicely why the bus was taking a few minutes to get going, but if the person wasn't kind and patient about it, I might have been tempted to lash out a little. Here's my attitude, and I know it's not really a good one - nobody has the right to get upset about my sons' special needs putting a damper on their own needs, since my sons' entire lives are about struggling to fit into this world that isn't made for them. Be nice, but know that your son and his bus have as much right to the road as the cars do, and while you can appologize for the delay, you don't need to feel excessively bad about it. That able-bodied person can WAIT a minute, and think about how good he has it. Sorry, I get a little feisty.